On this day in the year 1775, for the last time on European soil, an individual found guilty of the crime of witchcraft is killed in an official, state-sanctioned execution, in Germany. On this day in 1868, shogun Tokugawa Yoshinobu surrenders Edo Castle to Imperial forces, marking the end of Japan's Shogun era and the beginning of the Meiji Restoration. This development came about partly because, after American Commodore Matthew Perry showed up in Japan accompanied by an impressive fleet of technologically advanced warships, Japanese elites collectively freaked out. They hatched a plan to get rid of the samurai class and the feudal, agrarian system over which they presided and replace it with a more forward-thinking oligarchy, headed up by a hereditary figurehead, the aforementioned Emperor Meiji. In less than half a century, the combination of rapid cultural change, techno-fetishism, the sublimation of a disgruntled samurai remnant and increasingly obsessive Emperor worship would lead to some of the most unfortunate chapters in the history of all mankind. On this day in 1876, the Benevolent and Protective Order of Elks is first organized. They remain one of the leading fraternal orders in the United States, with over one million dues-paying members. On this day in 1941, the Nazis take over Germany's most popular Jewish weekly newspaper. The abrupt change in editorial tone proves unpopular with subscribers. Sales plummet. 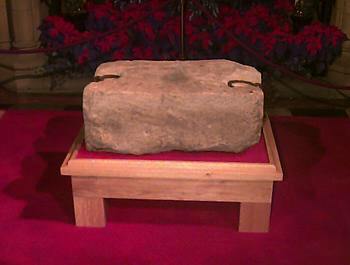 On this day in 1951, less than four months after its theft from Westminster Abbey by Scottish nationalist university students, the Stone of Scone is discovered hidden beneath the altar of Arbroath Abbey in Scotland. The origins of the so-called "Stone of Destiny", which played a minor role in the recent film The King's Speech, is shrouded in mystery. Some claim that it dates back to Antiquity, or even that it is the legendary "Stone of Jacob", the rock upon which the biblical patriarch was resting his head when he was delivered a "divine revelation" from Jehovah, as detailed in the Book of Genesis. But it's probably just a rock. On this day in 1961, the trial of fugitive Nazi technocrat Adolf Eichmann begins in Jerusalem. After World War II, Eichmann had fled to Argentina under an assumed name, where he worked for Mercedes-Benz until he was identified, located, then kidnapped by the Mossad, who brought him to Israel to stand trial for his central role in organizing the Holocaust. He was found guilty and hanged in 1962, the only person ever to be executed in Israel based on the findings of a civilian court. On this day 1968, President Lyndon B. Johnson signs the Civil Rights Act into existence, prohibiting discrimination in the sale, rental, and financing of housing to individuals based on their race. At the time, pondering the effect this might have on voters in the formerly Democratic-leaning South, Johnson is said to have said: "We've lost them for a generation." It turns out he was way too optimistic. This day in 2001 saw the ignominious conclusion to the Hainan Island Incident, the first real crisis of Preznit Dubya's heart-breaking White House career. On April Fools Day, an American spy plane had to make an emergency landing on a Chinese island after being bumped out of the sky by a Chinese fighter jet. It was on this day, ten days later, that the 24 American crew members were released by the Chinese government, but not before the White House issued a groveling apology, which they preferred to characterize as "an expression of regret and sorrow" over the death of the Chinese driver... I mean pilot. A coincidence of note is that the American aircraft was a Navy EP-3E ARIES II signals intelligence aircraft, and the incident took place while the sun was in the Zodiac House of Aries. Aries is ruled by the planet Mars, God of War. And, finally -- last but definitely not least -- on this day in 2002, an attempted coup d'état takes place in Venezuela, resulting in the temporary ouster of President Hugo Chávez. If you relied on Western media to inform you about those infuriating, exasperating, incredibly inspiring days, then you have no idea what happened. I strongly urge you to give your undivided attention to the documentary, The Revolution Will Not Be Televised, embedded below. It's one of the most important documents ever produced in terms of its revelations about the the true nature, focus and direction of American policy towards Latin America. Just watch it. From beginning to end. I'm serious. It will infuriate you, and you will never forget the lesson it teaches. History is doomed to repeat itself. Especially as we strive toward the technological advancements we have and will achieve. Common items (Like this - https://bullionexchanges.com/50-peso-mexican-gold-coin) will become the most valuable items on the planet.